In this post, we’ll answer the question and hopefully provide some valuable guidance – for new users and even those who have some experience. Here are some examples: website pages, landing pages, blog posts, videos, webinars or podcasts, quizzes, games, earned press, or any other content that will engage your audience and achieve your advertising goals. You probably have all kinds of existing content that’s ready to go, or you may choose to create new content specific to the campaign. Whichever you decide, there is one thing to remember: Your content should not be a marketing brochure that lists the benefits of whatever it is you are selling. Rather, it should be compelling, informative and useful to your target audience. Focus on what the customer wants to hear, not what you want to say. For instance, say you are a travel insurance agent. Instead of linking to a web page that lists all the policies you sell, link to a post on your blog about “The Top 7 Most Dangerous Tourist Destinations You Should Avoid”. Include a CTA inviting travelers to contact you for a great deal on insurance for their upcoming trip. No hard selling – that’s the key to successful native content. As mentioned above, your Outbrain campaign has two components – the native ad, and the linked content. In #1, we covered the content. Now, we’ll discuss the ad. Your Outbrain ad is native to the web page it is featured on – that means, it doesn’t stand out as an ad. Rather, it blends in like an editorial feature, which makes it more likely that readers will click (as we all know, online display ads get very low Click Through Rates). So, you need to create a catchy headline and choose a compelling image for your ad. Make sure your headline and image are relevant and appropriate to the linked content. Don’t write a headline promising something you won’t deliver. For example, the ad headline “Extreme Travel? Get Cheap Insurance” would not be suitable for the content mentioned in point #1 (Top 7 Most Dangerous Tourist Destinations to Avoid). You might grab the reader’s attention with an attractive promise, but when they click through to your article, they will be annoyed and likely leave fast. Rule of thumb: Avoid “Too good to be true” statements or unsubstantiated claims. We’ve done some pretty deep research into which ad headlines and images work best on our network. Check out these data-based best practices and get your headlines and images working for you. Ok, so your content is all ready, and you want to submit your campaign. Stop! Before proceeding, you need to check that your content complies with our guidelines. What’s so important about the content guidelines? Apart from weeding out the more obviously undesirable content, it helps us maintain a brand safe, high-quality advertising environment – and this brings higher quality traffic to you. As a matter of fact, the content guidelines benefit you as well as Outbrain! Our advertisers play an integral part in maintaining the high standards of the Outbrain network. That’s why we require you to meet certain requirements in content quality. 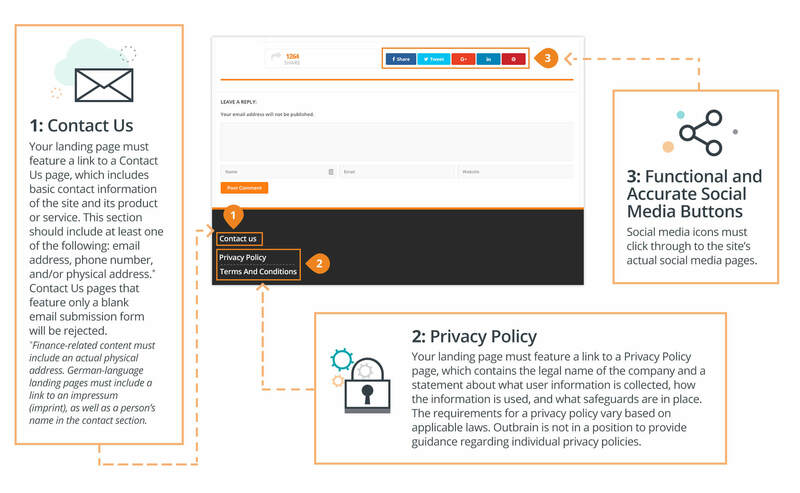 So, make sure to check out our guidelines before submitting a campaign. There must be a Contact section. Your page may also be required to have “Advertorial” disclosure. Make sure every button and link on the page leads to the proper location. This includes your social media icons. They must link to your actual social pages. When it comes to creating content and complying with guidelines, you’re never alone! Check out our Help Center, where you’ll find answers to loads of questions. And if you are uncertain about whether your content is compliant or not, email [email protected] before you launch and we’ll assist you. If your content got rejected, don’t worry – it can take some time to get familiar with the guidelines. Remember, this is an opportunity to help us maintain a high-quality network that will bring you better traffic. If your content is rejected, you will receive a notification email that includes tips about how to adjust your content to make it compliant. Just follow the suggestions and you should be A-OK. If it doesn’t help, reach out to [email protected] and we’ll address the issues and get your content up and running. Though it may seem overwhelming at first, it’s not difficult to generate the content you need. Oftentimes, you already have online assets that are suitable for your Outbrain campaigns. Take the time to review all your existing content and see what might be worth promoting. As for meeting the content guidelines, it’s simply a matter of getting to know the rules. Once you’ve got a handle on it, you’ll find it’s easier than it seems. 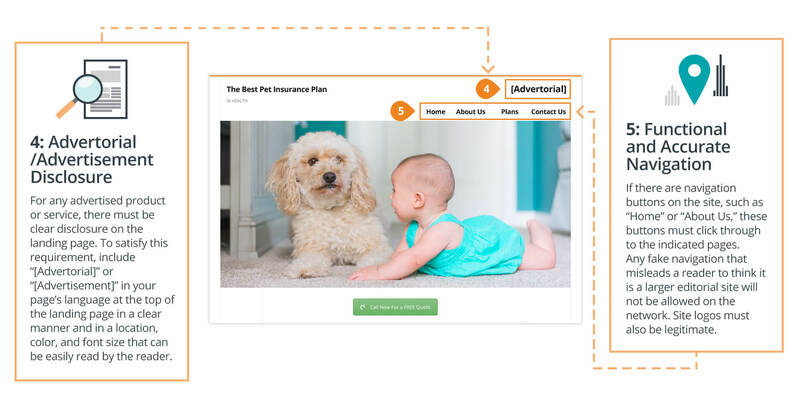 Follow the steps above and you’ll see results from your Outbrain campaigns in no time. Happy contenting!